Grand Opening for Orchard Hills went Great!! What is not to like about this new subdivision in Phenix City. The home pictured has 2468 sq. ft. with 4 huge bedrooms and 2 and 1/2 baths, 2 living areas, fireplace, large kichen with breakfast bar and is only prices at $155,990. Combined with the low interest rates available that puts your house payment extremely low - well within most BAH's at Fort Benning. Additionally we have 5 bedroom plans just starting and plenty of lots to choose from where you can choose the lot, house plan, colors, and amenities! This subdivision feeds Phenix City Schools and is less than 10 miles to the main gate of Fort Benning or to the West Gate of Fort Benning. It is also close to shopping, parks, schools, and all the amenities you want access to in the Phenix City/Columbus Area. 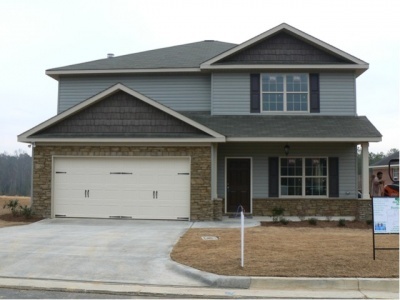 These plans are also available in Bunker Ridge only a couple 3 miles from Fort Benning in Ga.
Iam a firts home buyers and I dont have down payment can you help a buyers like me?